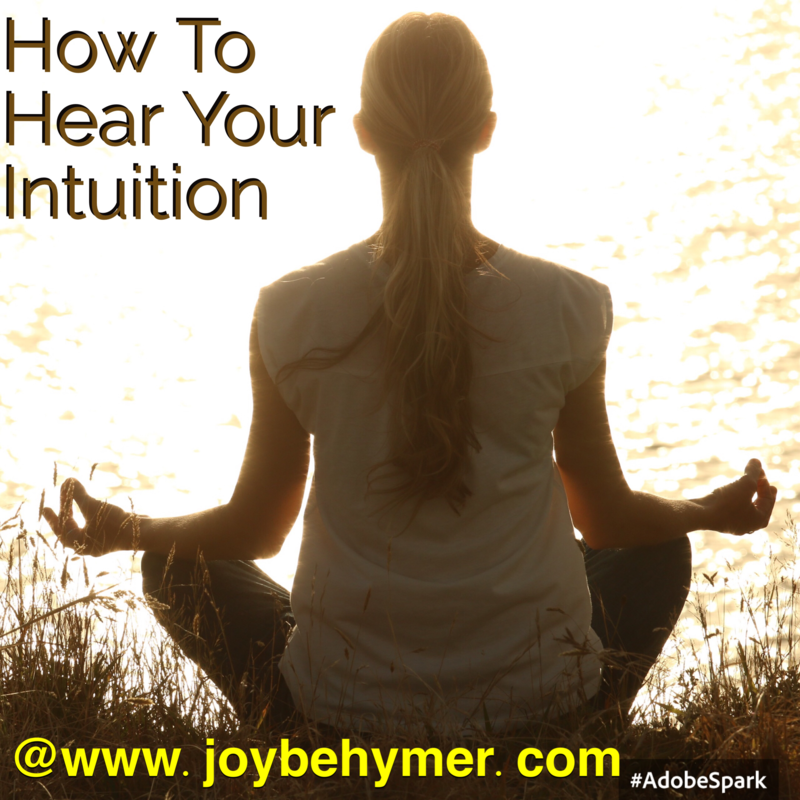 My clients (and recently a few of you readers) frequently ask me about how they can hear their intuition. In a busy and often daily life full of noise, it can be tricky to recognize your intuition. It is often subtle and takes time and practice at tuning in. At times during danger and in crisis, we can feel those instincts and vibes loud and clear, but in our daily life they may not appear as obvious. Another reason they are not so easy to identify is because we may not be very used to tuning in and listening to our inner selves. When we get caught up in our busy lifestyles and do not take the time to be quiet and tune in, we can be rusty at acknowledging when our intuition is giving us clues. It is important to take some time for ourselves to listen and develop ways to recognize those messages. Receiving our intuitions and gifts feels different for everyone. There is no recipe that works exactly the same. There are many paths to tune in, but what resonates with one may not work as well with another. It’s also a good idea to explore and try many avenues to see what helps you the best. Be gentle and easy with yourself. This is a fun way to do things that feel good to your soul. The more you pay attention to the little feelings, the more you are able to connect within. Meditation is a practice that helps you tune into the messages from your intuition. (I know I start often with this one, but it really is a good tool if you give it the time, space, and practice.) It is called a practice because the more you do it, the more you can allow those feelings to flow through. You can take it slow and work your way into a longer practice and utilize it when and how it fits into your life. Meditation is clearly not the only avenue, but it can be a strong ally to those that develop a habit. If the thought of meditation is really intimidating to you, you can always think of it as sitting in the quiet for a few minutes to concentrate on your breath and calm yourself. Sometimes that is all you need to recognize the next step or simply feel a little better. Another wonderful way to connect is by using your creative energy. For some this may be though painting, sewing, knitting, writing, drawing, dancing, praying, practicing tai chi or yoga, playing an instrument, gardening, hiking, or doing anything that brings your soul joy or relief. It is through these practices that you move out of your head and more into the flow of the activity. These are also other forms of meditation. To understand meditation a little better, I like to think of it as an act that helps you slow down the 10 million fast-moving thoughts that occupy much of your mind daily. The more you can get lost in an activity that you love and that brings you peace, the more you allow space for your intuition to come through loud and clear. It can communicate in a variety of ways. It may be as simple as knowing of which direction to move next. You may feel or hear a “yes” or “no” come through to a question or situation you have been pondering. Many times when we struggle to hear an answer, it doesn’t come through immediately. I’ve learned if you put the question out there, you can receive some guidance through these acts of meditation. I once heard a Buddhist lama speak on a walking meditation. The emphasis was focusing on an act to clear your mind through a moving meditation. You can accomplish this not only while taking a walk, but while performing simple acts like doing the dishes, folding laundry, sweeping, or any repetitive chore you do often. The idea is to learn to be present in the moment of what you’re doing. Many times when we are doing these activities our minds are also simultaneously thinking of many other things. We aren’t being in the moment and our minds are elsewhere. If you can take an activity where you actually focus or perhaps even try to enjoy what you’re doing, you are changing the flow and energy to open up more toward your intuition. I think this is a good avenue to point out, because we often use the excuse that we are too busy to be quiet. This is a way you can tune in while getting some things accomplished that you feel you need to. It’s about being creative and present with your time and actions. I find when I bring myself more to the present moment I enjoy chores more. It’s not a dreadful thing I need to get done. I am more calm and peaceful rather than rushed and stressed trying to get my to do list done. Whether you are taking some time to be present in your activities or enjoying activities you love, you are opening and allowing your connection to your intuition and your inner self. The more you practice, the more you deepen relationship. If you don’t have many hobbies and don’t feel you know how your creative energy flows, just follow any activities you enjoy. You can also explore some things you have been drawn to or always wanted to try. The key to know how you channel your creative energy is when you can get lost in what you’re doing, or anything that simply brings you joy. You don’t have to be good or a master at anything to enjoy what you’re doing. The point is to open yourself to the flow of your creative energy. The more time you spend in this flow, the more you can pick up on your intuition. Your outlook in life is your compass. Often the results you get depend on how you project it to go. When I worked in surgery I started with patients in the holding area before their surgery and frequently took care of them in recovery. Through the years, I observed that when they declared their surgery would go well, it did. Those patients that were more fearful or worried about pain or being sick in the recovery room, sure enough those patients woke up sick and in a lot of pain. Through my years of being a nurse, I found it fascinating to observe how often this played out. It was surprising to me how often their intentions were followed by their experience. It wasn’t always easy to try to ease a patient’s mind before surgery, but it was a big part of my job then. I felt the more calm I could help them be, the better their experience would be in the recovery room. When I focused on educating them and easing their worries as much as possible, I then found smoother results in the recovery room. I also noticed that I gave less pain medication in turn as well. We were very lucky in those years of having successful turnouts and very few emergencies. In my position at a surgery center, I had the opportunity to be involved in their entire process. It started out that I would call the patient at home to schedule their surgery and answer their questions about taking care of them before and after their surgery. At the end of the process I called them at home to check on them. I got to experience their full circle of their outpatient surgery. I also did quality and assurance reports that helped me verify my observations. I had a really awesome privilege of working with some of the best nurses, technicians, and office staff out there. I believe it led to the patients doing so well. I also had the opportunity to work in hospitals that weren’t so well-oiled. I was pulled to many floors working with crews that I wasn’t used to and in less operative conditions. Even though these environments had many differences in how things worked, I was still able to conclude many similarities. At one particular hospital, I floated and was assigned to a variety of floors/departments. A few floors were “known” to be very difficult floors because of the severity of illnesses in those patients and often a less smooth running system. In my attempts to balance out these situations, one advantage I used was knowing that if I could assist my patients in their outlook, I could survive my shift and take care of them better. At one hospital, I often observed many of my co-workers starting the day with a big list of orders and being forced to “hit the floor running,” so to speak. I noticed that they struggled to keep up with their charting (mandatory legal documents that recorded all their actions ). When I worked these floors/situations, I was able to use my experience of my observations to assist me many times. I tried a different path to help navigate my experience with these challenging situations. For example, rather than jump right into my list of duties and responsibilities (as I noticed many nurses do), I took about ten extra minutes with each patient on my initial rounds to practice my skills of communication and calmness. When I felt they knew my intentions I headed towards my orders. At first glance, it looked like I was way behind the other nurses on our duties, but i found it to be an investment of time that rewarded me greatly later on in the shift/day. I only did a few simple things that paved a smoother day. I took the time to sit down, look the patient in the eyes, and simply explained my intentions for the shift. I wanted them to feel secure that I was there for them and would do my best to address their pain, illness, and needs during my shift. It sounds so superficial, but made a great impact later in the day when I had time to sit down and chart while I observed many co-workers struggling to keep up. They seemed to have many patients calling out at the same time and they couldn’t find time to sit down, eat, chart, or even visit the restroom. I’m also not saying we didn’t have our emergencies from time to time and everything was always smooth sailing… I did work in a hospital, but I am convinced that if it were not for that extra little time to assist in my patient’s outlook, I would have also been struggling so much more to keep up with my responsibilites and neglecting what in my heart I felt was a good job. I certainly wasn’t the best nurse working on that floor. Nor am I comparing my capabilities to my co-workers. I’ve worked with so many amazing people. I just wanted to point out that I was able to use what I learned to benefit me in difficult situations. I found when my patients felt safe and secure, they needed me less. They were less sick and in less pain. I felt I gave much less medication when the patients felt some confidence over fear. When you can meet patients’ emotional needs, you address the bigger ones easier. When someone is sick, in the hospital or facing a procedure, you don’t always understand the stress and fear happening on their inside. If you can assist with this aspect, the care and outcome can be more optimal. Patients tend to do better when they are less stressed. I’ve learned half the battle is in the communication and their outlook. A positive report and outlook you can establish with people seems to in turn greatly affect the experience. 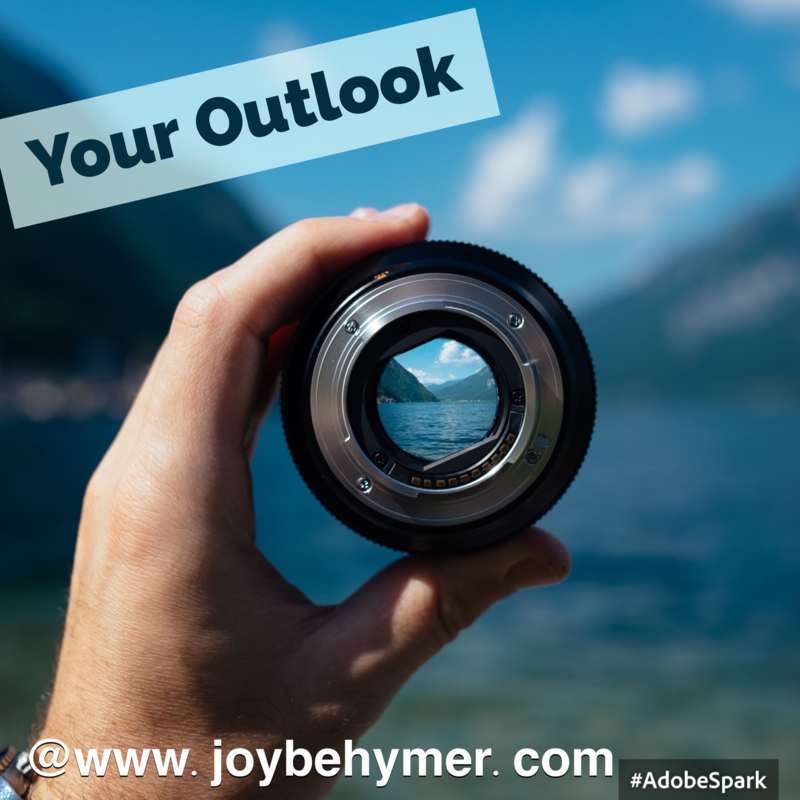 Just as I had opportunities with the outlooks to help my patients, your outlook in whatever you do in life can help you leverage your experiences. To steer it better can depend on your outlook. We can often get in the habit of starting our day running and busy without intention. To help you have a better day, you have an opportunity in how you choose your outlook. We often get exactly what we expect. In my experience I can definitely say it’s worth the extra time to focus on your outlook daily. It’s like preparing the way for your day to be smoother. 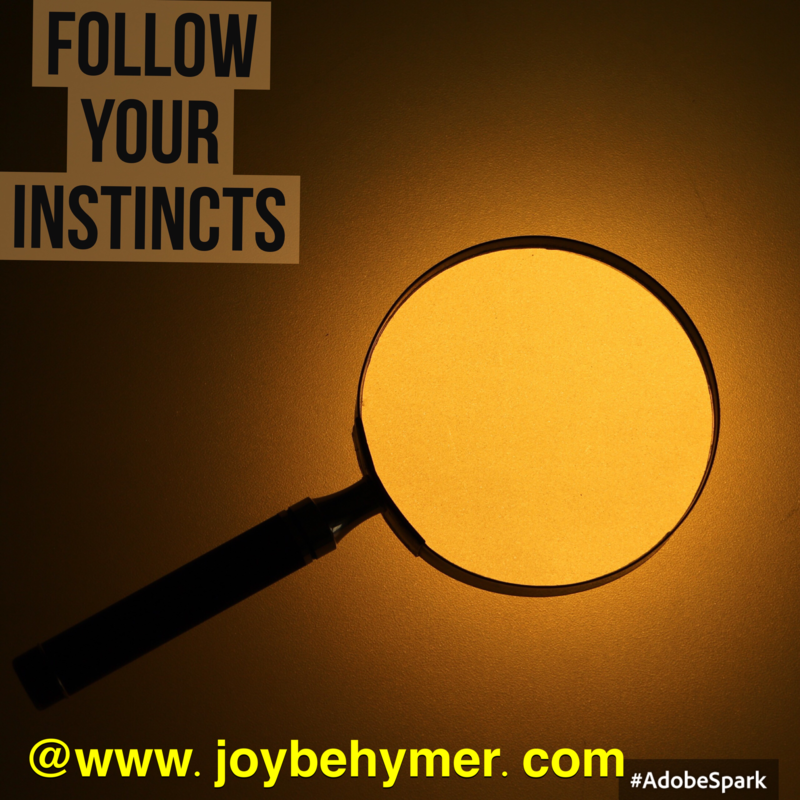 One of your biggest assets is following your instincts. No matter how much knowledge or background you have in what you’re doing, you can always count on your instincts. It is a gift that helps you navigate through life. So often our instincts are right while our minds may not understand it at the time. So often our intuition has a feel for how things are going, or a feeling about a person you may be interacting with that your mind hasn’t been presented with evidence on. Have you ever given someone the benefit of the doubt even though your instincts gave you a funny feeling? Because your mind had no proof, you may have ignored that feeling… then later figured out your instinct was right. It’s like a little hunch you get and cannot explain. It is your internal guidance system. Though we have choices in life of what we believe and which direction we take, our instincts give us clues about the world around us. Our brains are actually complicated in how they process and give us information. Our instincts pick up and work on frequencies that our brain may not process and download for us. I like to think of it as helpful nudges that serve you well. Sometimes it’s even not what we want to feel, but I have always found it to be true. We like the idea of believing the best in situations and people, but if your instincts tell you to go a different way, it is a blessing trying to assist you. Even though it may not make sense at the time. This is where your trust in yourself comes in. We can let our mind talk us out of our instincts, but if we can have faith that it knows best, you may save yourself some heartache and trouble. If you can believe that your instincts are very smart, you can leverage your experience more powerfully. Possibly even more positively along your journeys. Over the years in talking with clients, I can see many have lost their trust in their intuition. Perhaps because of a hurtful experience. Sometimes we tend to listen to others over ourselves. Many times we can get so caught up in stress and busyness that we drown out those little hunches and feelings. A good way to tune in before making decisions or facing a situation is to give yourself some time and space to sit with it. When you can allow some silence and slow down your mind, you can receive guidance of what is your next best step from your intuition. It just takes a little patience with yourself. Just as you would take some patience teaching a child to learn, you can assist the growth of tuning into your intuition more. The more you tune in and practice listening to your inner self, the easier it gets to hear when things are hectic and busy. In those moments that a situation or circumstance arises quickly, you can trust those first instincts. It won’t always give you all the answers in the instant, but you can get the feeling of a direction to follow. Sometimes you have to keep your instincts to yourself until you can understand the big picture better, but it really is your biggest ally. Think of it as your best friend—always cheering you on and attempting to guide you safely.